I’m in a pub in the Calton. This Glasgow ward’s male life-expectancy of 53.9 compares unfavourably with almost anywhere else in the world other than bits of AIDS-ravaged Africa. How revealing is that? I’m surrounded by smoke, sectarian images and misplaced optimism. What better place then to read the Scottish Arts Council’s Annual Report for 2004/5? The meat of the document is a set of accounts for the year ended 4 April 2005 (signed off in October 2005 so this is the most up-to-date data available), but before that there are plenty pages to wade through, full of photo opportunities and purple prose. I look up when I get to the Chairman’s foreword. There’s a bloke at the bar dressed in an XXL shirt of hooped green. I try to imagine that he’s saying: ‘At the Scottish Arts Council, we want a passionate and confident land, bright with colour and alive with song—a land where the arts can define the essence of our humanity quite as importantly as justice and love.’ But it doesn’t quite come off. A single pint, reams of blurb, the figures themselves, all set me up for the day. I walk out the pub door and ten minutes later I’m in the Gorbals, passing the Citizens Theatre (core grant £900,000; worth every penny, I suspect), and have arrived at One Ton Prop. This is a new artist-run space located in a first-floor flat. It takes me a second to adjust: the white cube is smokeless, with no picture of either the Pope or a baby in football colours present. Instead there is sculpture and two-dimensional work by individuals who obviously went to art school. I ask Michael Roy, whose flat it is, if One Ton Prop received any Arts Council money. Apparently, they didn’t apply for funding, though they will next time. He and his co-curator Stephen Murray have painted the space themselves, made the temporary partition wall with material from Steve’s studio, hired a van for a day to collect the work, paid for the drinks at the opening and done as much advertising as they could out of limited resources. The gallery is really just a way of getting some work of their peers out of the studio and into a more formal space where it can be discussed by friends and strangers, and reassessed by the artists. I take another look at the show, There’s a new kind of beauty afoot, which includes the work of three artists who studied at Duncan of Jordanstone a few years ago. Sarah Forrest’s sculpture is titled ‘Wonderfully Solid’. Ironic? Well, there’s a wide platform held aloft, which looks as if its about to topple over, thanks to the structure’s tiny base and the two hulking great metal arms coming towards it from out of the floor. My own title for the hard-edged piece is ‘The Squirrel Bar’. In Andy Slater’s warm painting ‘I’d give you flowers, nothing but flowers’, which is awash with leaves and sunlight, a couple are sharing a pot of tea and a spot of intimacy. Appropriately, Michael offers me a cuppa, and as we drink I raise the issue of contemporary art and social inclusion. Let’s face it, only people who are already in the know are likely to make their way to One Ton Prop, although there is a poster on the ground floor of the building and the door is propped open to all. A sip of tea gives me a vision of Andy Slater showing his work in the Calton with the help of sandwich boards. But I don’t mention this. I wouldn’t be so brave—or so patronising—in getting my own ideas across, so why should a contemporary visual artist? Tam A’s work includes a view of what is clearly the National Monument on Edinburgh’s Calton Hill (a distant relation?). 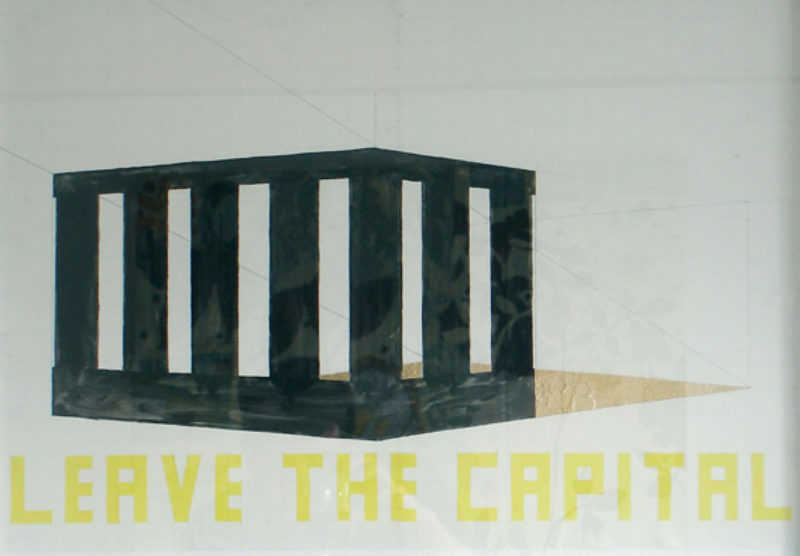 In bold letters, the artist paints ‘LEAVE THE CAPITAL’. Clearly there is some kind of Dundee-Edinburgh-Glasgow connectivity not far under the surface of this show. Well, Scotland is a small country and as its citizens become more mobile, the interaction between cities and regions is bound to increase. Steve tells me that Tam A, who lives in Edinburgh, was able to finance himself for a three-month stay in Prague with help from his Czech girlfriend. I guess the resulting experience was a complex one. That structure on the Edinburgh skyline is just a façade. Maybe Prague contains something real. In the image, there are reversals of expectations and second looks going on. After all, it’s the shadow of the monument that is golden, not the thing itself. You have to leave the city to value its memory? You have to leave the city to get its qualities—positive and negative—in perspective? As I walk towards Central Station, I’m conscious that I’m also walking towards The Modern Institute (core funded to the tune of £50,000 in 2004–5, rising to £51,500 in 2005–6). I was there last week and saw the Luke Fowler show [reviewed on page 55 of the magazine]. Fowler’s multi-media work reconsiders the career of Cornelius Cardew, a maverick philosopher-musician and self-styled revolutionary who founded the Scratch Orchestra in 1968. The show can’t help but reveal the relationship between such an artist in those idealistic days, and the current wave of artists who are equally interested in music-based culture, communal happenings and collaborations between professionals and the public. Jeremy Deller, Grizedale Arts, Luke Fowler himself and the aforementioned Stephen Murray [who has contributed to the GANGHUT], are amongst the names that come to mind in this socially engaged context. In the film that is the centrepiece of the Modern Institute show, Pilgrimage from Scattered Points, Fowler blends archive material and interviews conducted 30-odd years after the main happenings of the Scratch Orchestra’s five-year existence. Alone, I watched the 45-minute film in the gallery, from opening shot to a set of final credits which state that Fowler benefited from a Dewar Art Award in the making of the work. Notes at the beginning of the SAC’s Annual Report indicate that this was £25,000. Money well-spent on state-of-the-art editing and an absorbing piece of cultural history, I’d say. However, when I looked closer into these Dewar Awards—presented to people aged under 30 across the arts in Scotland—I noticed a leaning towards the performing arts. Luke Fowler’s award was in 2004. In 2005, there were 42 awards, about half of which were to musicians to buy classical and traditional instruments (rather than, say, for artists of all kinds to buy laptops). Most of the rest of the awards were to allow individuals to carry on with their musical studies. There was a single grant towards an artist’s travel in the list; and another so that a visual artist could take a place at art college. But these exceptions just emphasise how biased the Dewar Awards are towards the performing arts, music in particular. Which would be fine if that expenditure in some way benefited the population at Calton street level. But I can’t see that it does. The SAC accounts for 2004/5 show a huge slice of the pie going to music and other performing arts. Of course, it wasn’t forward-looking Scratch-like crews that got the funds, it was the Scottish Chamber Orchestra, Royal Scottish National Orchestra, Scottish Ballet, National Theatre of Scotland and Scottish Opera. By and large, this was money paid so that these companies could reproduce the culture of a centuries-dead bourgeoisie! That’s how Cornelius Cardew would have phrased it, anyway. However, I’m not too concerned because changes in the Scottish arts-funding scene have recently been set in motion, rendering the SAC Annual Report that I’ve been looking at effectively a dead document. On St Andrew’s Day, 2003, Jack McConnell made a speech emphasising the importance of culture to a healthy Scotland. He pointed out that the confidence levels of children in Scotland were amongst the lowest in the world, and that culture could help do something about this, as well as contributing positively to other aspects of education and health. He had in mind a culture for the many, not just the few. He wanted excellence to be accessible, while envisaging that access should be to excellence. Inspirational common sense from the First Minister of Scotland! This was followed up by a Cultural Commission conducted by an independent body, which reported back in June 2005 with 130-odd recommendations as to how the arts sector in Scotland could be overhauled. Ministers had to ponder these for a while, naturally, and it wasn’t until January of this year that the Culture Minister came up with a response to the Cultural Review. What is to be the new arrangement for the arts? The Scottish Arts Council will lose control of the aforementioned national performing companies, and these will be funded directly by the Scottish Executive. At the same time, SAC will combine with Scottish Screen and the amalgamated body will be called ‘Creative Scotland’. Creative Scotland? I like the sound of that. Especially if the alternative title under consideration was ‘Non-Performing Scotland’. The SAC has taken the Executive’s ideas on board, and in March 2006 announced that from April 2007, instead of core funding of organisations – a system that currently soaks up about 80 per cent of funds – there will be a smaller number of crucial organisations that get ‘foundation’ status. Apparently, this will mean that as much as 50 per cent of total funds will be left available to non-foundation organisations and individuals to finance one-off projects. As well as this, substantially more money for the arts has been promised by the Scottish Executive. The visual arts sector may well be in a strong position to attract a large share of those funds, given its ability to deliver value to citizens of all ages and social classes. Fine, in theory. But what in practice will it actually mean ? I board a train and travel along the south bank of the Clyde in order to investigate a current project largely funded by the Scottish Arts Council and which may be a forerunner of what’s to come. It was mentioned in the Bulletin section of the last issue of MAP (the magazine is itself part-funded by the SAC, so things really are looking up!). The English artist Mark Neville, now Glasgow-based, was in Port Glasgow over the course of a year, during which time he engaged with the community at a number of levels and took thousands of photographs of the people and the place. Eighty of the photographs were bound into a high-quality, large-format, hard-backed book, and 8000 copies were delivered by members of a local boys club, reaching every household in the town. One or two of these books are now for sale on the net, but I feel it’s more in the spirit of the project if I make the trip to Port Glasgow and see if I can get a copy that way. After all, with so many books distributed locally, inevitably some copies will be deemed of little value. For instance, by that section of the Protestant community that decided there were more images featuring Catholic subjects in the book. Trouble is, those copies have been burnt, which isn’t much good to me. There are no copies of the book in the bleak, windswept town’s only charity shop. I walk between a £1 shop and a 99p store and enter the Town Hall where I know that many of the book’s photographs were taken. I ask the receptionist if I can see the main hall where the Christmas party took place and was photographed by Neville. With alacrity, the council worker escorts me up there and soon we’re talking in the middle of the floor that was once heaving with merrymakers. Robert (we only exchange Christian names) speaks warmly of Mark’s presence in the town and of his project. He explains the arrangements that were taken so that the images produced on the night of the party would be of high quality. I tell him that I love the cover of the book, the picture of party-goers—arm-in-arm—being not just an iconic contemporary image but a deliberate echoing of Stanley Spencer’s Port Glasgow Resurrections . Robert doesn’t know about these, so I explain that Stanley Spencer was funded by the War Artists Advisory Committee to come to Port Glasgow during the Second World War, and that he came up with a series of powerful paintings of men working in the local shipyards. Spencer was so struck by the sense of community in the port that he came back again later to do a new series of paintings set in the cemetery. A tribute to the people of Port Glasgow who had lived, and died, and—in Spencer’s mind—were destined to meet again above the ground, in joy. Robert tells me he will look out for a book on Spencer, and that though he has not been to Glasgow’s Tramway before he will try and make it to the current show, What makes you and I different. This includes Neville’s piece, ‘The Ghost of Stanley Spencer Watches Over Me As I Walk Through the Shipyard in Port Glasgow’. Before we part, Robert asks if I’ve got a copy of Mark’s book. I tell him that I haven’t, and that I would very much like one. He takes me to a cordoned off area in the basement where there is a box of books, and generously offers me two. But I only want a single copy. Some other visitor—or a resident who has grown out of his or her anti-art phase—will be sure to want the copy I’m turning down, just as badly as I want the copy I accept with thanks. It’s a book I’d expect to pay more than £20 for. If cost of production was, say, 25% of this notional selling price, then with a print-run of 8000 books, we’re still talking about a fair chunk of funding, and that’s just for the book itself. I finish my day with a walk through Port Glasgow Cemetery. There is a colour and a life about the place that has only really been apparent in the town itself that afternoon through Mark Neville’s book. I congratulate the artist on piercing the hard skin of a West of Scotland community and revealing something warm and complicated and human underneath. And I congratulate the organisations that funded him to do so, their investment coming back to the community, in kind and in spades. In one corner of the cemetery are examples of a kind of gravestone that I recall seeing in one of Spencer’s Resurrection pictures. The thin pieces of stone or slate aren’t actually stuck in the ground but are meant to rest there, supported by a length of metal rod bent into a hinged support (shipbuilding skills?). Wonderfully solid? Well, no, you could lift up one of these stones and set it down somewhere else in random relation to the buried body. The phrase ‘There’s a new kind of beauty afoot’, flies to mind. Especially when I’m looking down at an anonymous marble gravestone, marked simply: ‘THE GOLDEN BOY’. His dates are given as 1917 to 1992. That adds up to 75 years of shining life. But we mustn’t get complacent. Health statistics from 1997 indicate that if you’re a young adult between the ages of 15 and 44, you’re more than twice as likely to die if you live in Port Glasgow (or Hammersmith or Southwark) than the average British citizen. Twice as much resurrection joy in store, one might say. But in reality, I doubt if it works that way. Creative Scotland? Let it flourish.